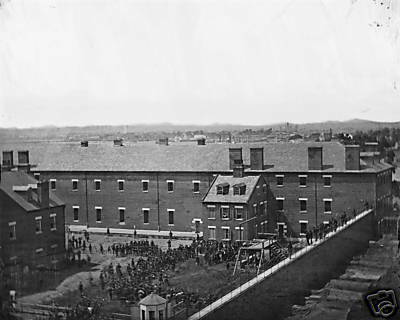 LOOKING FOR CIVIL WAR DIARIES, LETTERS, PHOTOGRAPHS, ARTIFACTS AND KEEPSAKES for possible inclusion in our upcoming book and documentary about the Old Arsenal Penitentiary and the Lincoln Conspirators. Example: Ed Isaacs family has been living in the northeastern United States for several hundred years. Last year Ed’s cousin Pam gave him the diary of his great-great grandfather George Dixon. 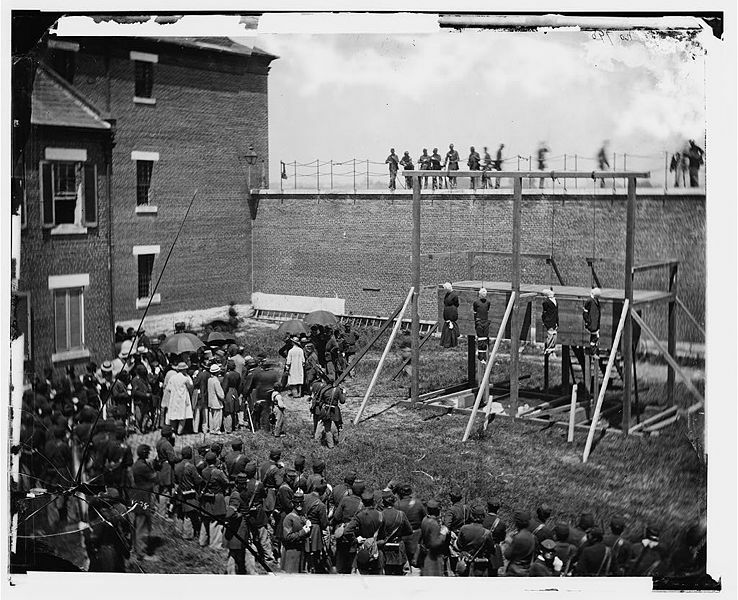 George was a Civil War Union soldier who was stationed at the Old Arsenal Penitentiary in Washington DC during the incarceration, trial and eventual punishments of the Lincoln conspirators. Amongst other interesting notations found in the diary, George listed the cells used by the prisoners and the guards who watched over them on the last day or two leading up to the executions of four of the conspirators. Ed Isaacs contacted me awhile ago and shared George’s diary with me. We have become friends and are planning on including information about George Dixon and his diary in our upcoming book and documentary. Ed hopes that it will help celebrate his ancestor’s life and we are thrilled to do so. To read the story of George Dixon and his diary as presented by Ed Isaacs, please click on the following link https://awesometalks.wordpress.com/an-awesometalk-with-ed-isaacs-owner-of-civil-war-diary-from-soldier-who-guarded-the-lincoln-conspirators/). APPEAL FOR HIDDEN HISTORY: We are appealing to others out there who might have ancestors who were connected directly or indirectly to the Lincoln conspiracy, the Old Arsenal Penitentiary, Washington DC or other Civil War occurences that related to the events that took place between March and August of 1865 in Washington DC and other surrounding areas. Items such as personal diaries, letters, photographs, artifacts, keepsakes and other Civil War related items in your possession could contain valuable historical information of great significance presently unknown to the research community. We would love to include your finds, if historically relevent, in our book and documentary. So check your attics, basements, the old shed out back, garages, farm houses, barns and even below the floor boards of your old home. Check with your family members about stories that have been passed down from generation to generation. Those conversations may give you a clue as to where your ancestors may have been during the time of the Civil War and the Lincoln assassination and conspiracy. Even if you do not know whether you have something that is important, you should inform us anyway. A name of a buddy or commander found in a diary could be very important. A location mentioned is a possibility. A comment about contemporary events from the time of the assassination may be the perfect thing we are looking for. You never know what might be important to our projects and the historical community in general. And if you do find something that doesn’t necessarily fit within our research, we will do our best to help direct you where you can go to get more information about your find. We are looking for genuine historical articles from the time of President Lincoln’s assassination, funeral, conspiracy trial and prisons located in Washington DC (Old Arsenal Penitentiary, District Penitentiary, Washington Penitentiary, Old Capitol Prison, Carrol Annex and Carrol Branch Prison). Items related to the Navy Yards and the ironclad monitors USS Saugus and USS Montauk could all be important clues to help tell the story better. And don’t forget the potential connection to the Confederate Secret Service primarily run out of Montreal, Canada or Lafayette Baker who was the head of the Secret Service for the Union. All great possibilities where hidden history may lie. Regretably we are not offering to purchase your family relics or assign a price to them. That is not our specialty and we cannot offer expert advice on an artifact’s value short of its historical significance to the story. As mentioned before, we will do our best to help direct you towards those who might be able to assist you. But no guarantees of course. If you have an item that you think might be of interest to us, please do not use the comment area below. Instead, write me directly at outreach@awesometalks.com and I will get back to you as soon as I can. Please describe the item (and include a picture if possible). If relevent, please explain why you think this may relate to our research. As you can see from previous postings on this blog over the past 18 months, we have had a few really cool finds that I’ve been able to share with you. The George Dixon diary, Mr. P’s original fake ‘Lincoln in Death’ photo used in many Lincoln books published over the years and some genuinely great stories from family members from their ancestor’s past. Give it a try. Everyone has treasures in their family. Share them. SIGN UP NOW FOR OUR BOOK UPDATE MAILING LIST at outreach@awesometalks.com. Just put the word “BOOK” in the subject line and include your name and email address in the body. You’ll then be included in our next email update. Thank you. Barry. 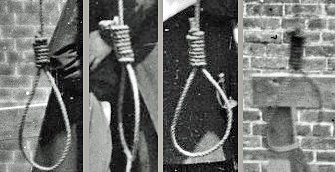 An image of the Lincoln conspirators' nooses taken from our upcoming book (title tbd). On a Saturday morning in September, 2009 I left a phone message for my future writing partner John Elliott to call me at my home. Upon his returned call, I explained that I had a proposition. John and I had been speaking and exchanging research for about 3 months prior to this call but were not working together at that time. My proposal was to combine our research and join forces to write a book together rather than just complete the one I had initially started a few months earlier. Each of our own areas of research could stand on their own and make good books independently. However, when combined, I felt that the final product would be so much more than the original concept. I was quite excited about the opportunity to do this merger and hoped John would feel the same way. When John called back he immediately accepted the proposal and we have been working ever since to make our book a classic. From the start, our attitude has been to produce a book that we would be proud to have on our own bookshelves, but which doesn’t exist right now. So far, our joint venture has proven itself to be ten-fold more than we imagined. So much so, that we’ve now attracted the interest of a prominent documentary maker to work with us in developing a proposal for a documentary. Hopefully we will have some good news to share with you on that subject very soon. But for now, it is safe to say that we are enjoying the research and our multiple projects and cannot wait to share the final results with you when appropriate. If you are interested in being kept up-to-date about the book and documentary proposal, then please add your name and email address to our mailing list. To do so, just write to me at outreach@awesometalks.com, write BOOK in the subject line and include your name & email in the body. Your information will then be added to the list and you will receive updates as they are released. IMPORTANT: Please be assured that I do not share my mailing lists with anyone and the sole purpose of this list is to keep you informed about these projects as per your request!!!!! November 6, 2008: Barry Cauchon. The date was July 7, 1865. Alexander Gardner and his assistant Timothy O’Sullivan took a series of ten photographs using both a large format camera with collodion glass-plate negatives and a stereo camera (used to make 3D stereoscope pictures). This series of photographs are considered on of the first examples of photojournalism ever recorded. 1. 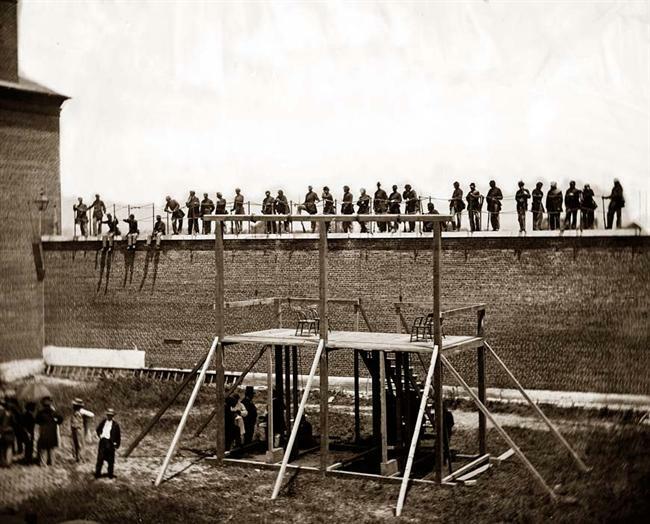 The Empty Scaffold – (large format) Reporters, soldiers and witnesses gather around the scaffold in 100 degree heat awaiting the execution party to arrive. 2. Arrival on Scaffold – (large format) The execution party, the prisoners and their guards, their ministers, etc. have arrived and gathered on the scaffold platform. The chief executioner was Captain Christian Rath. Three of the four conspirators have been seated. Only David Herold still remains standing. 3. Reading the Death Warrant– (large format) General Hartranft reads the Order of Execution to the prisoners and assembled crowd. 4. The Ministers Pray – (stereoscope) The execution party now listens to the ministers praying for the souls of the condemned. Reverend Abram Dunn Gillette is kneeling beside Lewis Powell. 5. 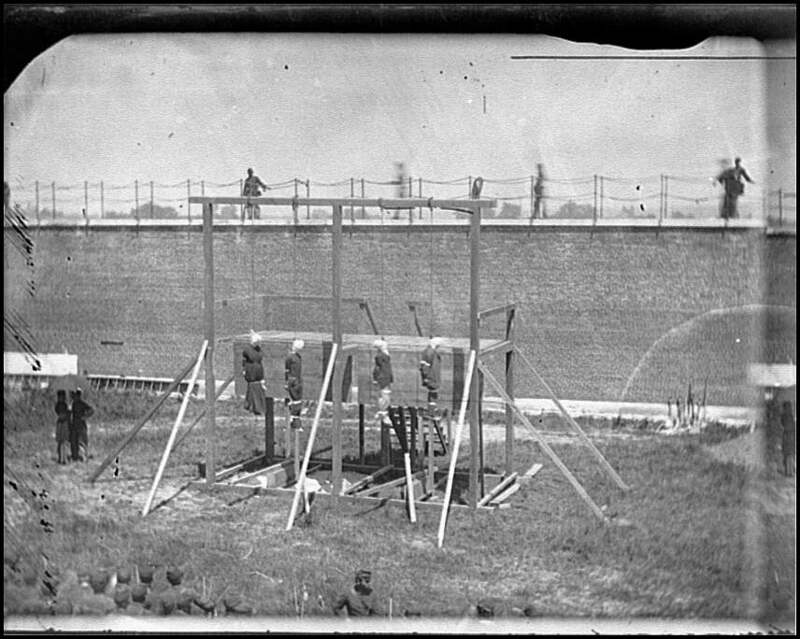 Adjusting the Ropes– (large format) The four conspirators are now standing (Mrs. Surratt is supported by two soldiers) and is being bound. A hood has already been placed over Lewis Powell’s head by Lafayette Baker’s detective John H. Roberts. 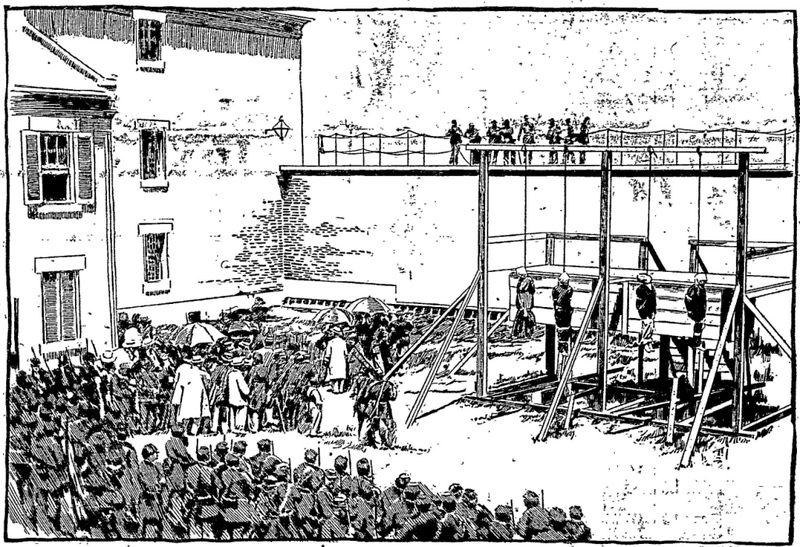 The nooses are being fitted around the necks of David Herold and George Atzerodt. 6. The Drop – (stereoscope) Gardner’s camera captures the moment just after the drop. 7 All is Done (1) – (large format) The bodies remain hanging for about 25 minutes before being cut down. 8. 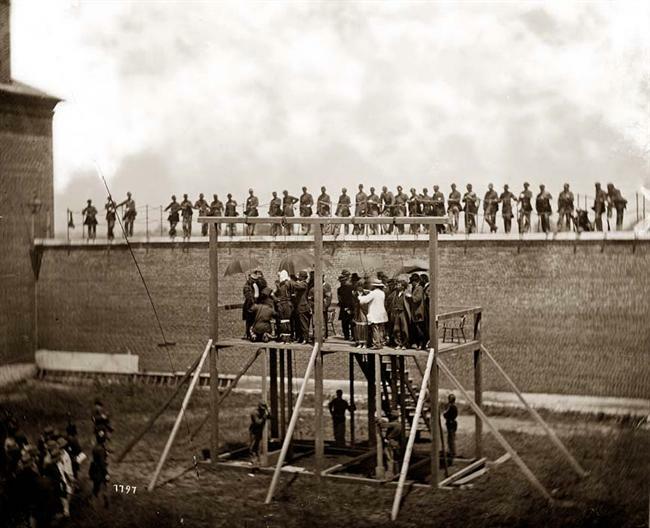 All is Done (2) – (stereoscope) The bodies remain hanging for about 25 minutes before being cut down. 9. The Pine Boxes – (large format) The pine boxes are stacked around the temporary graves dug next to the scaffold. 10. Rooftop View of Old Arsenal Yard and scaffold – (large format). The bodies of the conspirators still hang from the scaffold.